Some wonderful friends are in France at the moment. And to be honest, I’m madly jealous. This time a few years ago we took a trip to the Basque region of southern France and an abiding memory is watching our youngest son take on a huge bowl of Moules à la Marinière – in English, mussels in wine and cream – while sitting at the harbour’s edge in St Jean de Luz. The only thing that was a little difficult to explain was the tiny size of the Atlantic mussel when compared to our delicious green-lipped mussel here in NZ. Preparing mussels is actually very easy if you follow a few simple rules. Firstly, buy carefully. Choose each mussel individually and discard any that are cracked or damaged, and once home don’t soak in cold water but place a wet cloth over top until needed. 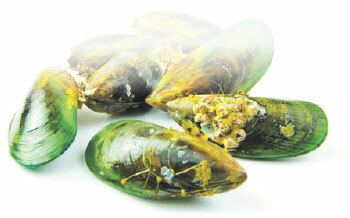 If mussel is open and will not close on sharp tapping, it is dead and should be discarded. Also throw away any that feel heavy. Now to the cleaning bit, bear in mind that the mussel is alive, and if you are rough it will protect itself by closing tight shut. So gently hold the mussel and in one quick movement slide the beard out in a motion that goes from the pointy to the blunt end. Finally, scrub mussels to remove any barnacles. Cook and enjoy. Boil garlic, shallots and onion in a large saucepan with the wine for eight minutes. Add mussels and steam for three to five minutes, shaking saucepan occasionally. Discard any that don’t open and spoon into a deep bowl. Carefully pour the liquid into a different pan, leaving the sandy residue behind. Bring this liquid to the boil and add cream. Reduce a little and pour over the mussels. Season and garnish with chopped parsley. Serve immediately.